Hi all! There hasn't been much news from my side of things, but I did have a marvelous time a week or so ago hanging out with some of my favorite authors. Really nice folks, Susan Squires and Christine Feehan, Susan Edwards, plus Melanie Jackson and a bunch of others. I even sold a few books at a booksigning. ...This was a wonderful fantasy tale. I really loved the Alanadale Society and it's different organization. It was filled with adventure, danger and excitement, plus the bonus of two romances, that of Thomas and Evelyn and Emma and Martin. The story also dealt with Thomas becoming a man and a leader. It also dealt with the healing of Emma and of Martin and they each overcame their pasts to accept the other as the person they were and as equals, which Evelyn was also forced to do with Thomas. This was a wonderful tale and I recommend it to all lovers of fantasy and romance. - Chere Gruver of Timeless Tales. Thank you, Chere!!! I love it! Hugs, Janet. And the winner of the Cupid Mouse is: Janet Gould. I'm going to wait for a new contest until I get inspired to take one of my collection of stuffed critters and make something special out of it. Contest to be announced later! Oh... My... Goodness! 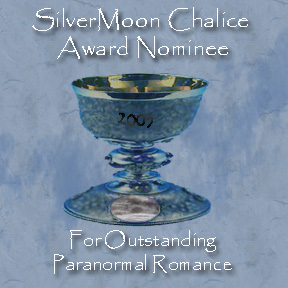 Lady of the Knife has been nominated for the SilverMoon Chalice award in the Fantasy category! I'm so thrilled! This is a new award offered by the ParaNormal Grassroots yahoo group and it such an honor to nominated. 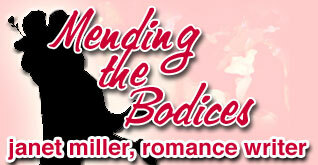 To celebrate Valentine's Day, I've written a new short story and put it up on the writing page. The title is "Cupid's Last Arrow" and it features the Cupid Mouse I'm giving away on the contest page. I'm also pleased to announce that I've made a second Cupid Mouse and it will be given away by my publisher, Zumaya Publications, as well as a wealth of other goodies. You can enter their contest by subscribing to the Zumaya Newsletter on the Zumaya home page. Good luck! Hi all!!! It's a new year, and so far the news has been great! First of all, my novella, "Opposing Forces" won an honorable mention in the "Once Upon a Planet" contest, which may mean it will be published eventually. Also, my short story, "The Woman Who Couldn't Say No" has been selected for inclusion in the Wyrd Wravings short story collection to be published by Echelon Press later this year. Yay, me! In contest news, the winner of Queenie, the Mouse Queen from "A Christmas With Sarah" was Stephanie Lynch (aka Arwen Nightstar). Thanks everyone else for signing up! The next contest will end on Valentine's Day, and I think the prize will be my version of Cupid... stand by for a picture when I get the little guy done! Ah, Holiday time, when we decorate and make good cheer for our families and each other. A Christmas with Sarah is #1 at Fictionwise in the romance genre, which certainly cheers me up. To celebrate I've put a new short story up on my website, "Just a Little Christmas", about a lonely man, a woman, and a broken-down Christmas tree. I hope you like it. First of all, the winner of the ANGEL PONY! Loretta Turner, yours was the number picked by my son's random number generator! Congratulations! Once again, the next contest starts immediately, and it is for the "Queenie", the Mouse Queen, one of the stars of my newest book, A Christmas with Sarah, which is burning up the charts over at Fictionwise, currently at #5 on the romance list. Also, my book Lady of the Knife has gotten two new wonderful reviews, which pleases me no end. All in all, this Thanksgiving I've had a lot to be thankful for. "Though the story starts out with Evelyn and Thomas, the true romance and most of the action involves Emma and Martin. Actually, Thomas and Evelyn become more secondary characters. I liked both men. They were heroes in every sense of the word. The heroines were great. I liked their strength and the fact that they did what they had to with no regrets. The body count was a bit higher than I like in my stories, but it wasn't exceptionally bloody, which helped. The violent part of the story was not the main attraction. I liked that there was a large portion of story told after the villain was vanquished. Truly, this tale is a wonderful escape from reality." "This was a wonderful fantasy tale. I really loved the Alanadale Society and it's different organization. It was filled with adventure, danger and excitement, plus the bonus of two romances, that of Thomas and Evelyn and Emma and Martin. The story also dealt with Thomas becoming a man and a leader. It also dealt with the healing of Emma and of Martin and they each overcame their pasts to accept the other as the person they were and as equals, which Evelyn was also forced to do with Thomas. This was a wonderful tale and I recommend it to all lovers of fantasy and romance." Read the first chapter on the publications page and be sure to enter the Angel Pony contest! I've downloaded my RT pictures. I'm not sure just who I have a picture of, but if you find yourself, let me know. In anticipation of the upcoming release of A Christmas With Sarah, I've updated the publications page. You can read the prologue and first chapter, plus a lovely author's quote from Megan Hart, author of An Exaltation of Larks. Oh, and don't forget to visit the contest page and enter the contest for the ANGEL PONY! An the winner is: Judy Theis! Yes, Judy, you are the soon to be possessor of the VAMPIRE PONY! Contratulations! I'll be sending email to you for your address. For the month of November, the prize will be the ANGEL PONY, with December's prize being "Queenie", the mouse queen doll that belongs to the little girl in my book, A Christmas with Sarah, which is just about to be released by Zumaya Publications. Plus, this month, in honor of Thanksgiving, I'm making everyone a winner. I've got some special giveaways left over from Romantic Times so if anyone wants some, send me email with your address. I have recipe cards with bread-dough ornament instructions, bookmarks, and carrot seed packages! Just a couple things. First, I'm going to be at the Romantic Times Booksellers convention in Reno next week, with autographed copies of my book, Lady of the Knife, and special preview information about my next book, A Christmas with Sarah, a contemporary romance set in San Jose. So, hunt me down, I'll be with the other alt-press published authors. Also, I got creative and not only made my vampire pony prize for this month, but the prizes for the next couple of months, an angel pony and mouse queen beanie, to celebrate my new book. I took a picture and put it on the contest page. So, don't forget to read my vampire story and check out my vampire pony. Also, I've decided to put up in the writing section the first chapter of my WIP, The All Night Inn. This is a contemporary vampire romance, set in a small coastal town of California. I hope you like it and will email me with comments. Once again, we've enlisted my son's help in picking the lucky winner and this month's new owner of a Beanie-Bess is: Yvonne Morris! Yippee!!! So, I'll be sending email to Yvonne, asking for her address. The rest of you can reenter for my special halloween surprise contest. I haven' t decided what it's going to be yet, but it should be pretty cool. Watch this space for the prize announcement. On other fronts, my editor is just about done with edits for my next book, A Christmas With Sarah, to be released in November. Rather than a fantasy historical tale, this is a contemporary story set in my backyard of Northern California, with characters based on my own experiences. My son's calculator was called into play to pick a random number between 1 and 63 and the lucky winner of my contest is Kathy Wright! So, Kathy, I'll be sending you an email asking for your address so I can send off my Beanie-Bess to you right away. Everyone else can reenter your names for my next contest where I'll be giving away another bean-bag pony, on my birthday, September 30th! More great news: Linnea Sinclair (one of my favorite writers) has reviewed Lady of the Knife and she loved it! Read her review over at Paranormal Romance here. Lady of the Knife is now available as an ebook at Fictionwise! This means that it can be purchased for as low as $4.25 this week as all new books have a 15% discount. In honor of my first month of being a published author, I'm sponsoring a contest to give away a PONY. See the details on the contest page. Lady of the Knife has gone to print! Available now from Zumaya publications and Booksurge. Read the first chapter here. Lady of the Knife has had it's first review! Zumaya Publications has contracted for my book, A Christmas with Sarah, to be released this fall. A mainstream romance, this story takes place in northern California, where we rarely have a white Christmas. But that doesn't stop Big Sur artist Molly Anders from wanting to make the season bright for her favorite five-year-old, Sarah Wilcox.